Today I am sharing a small business with you – The Market Boutique! I am featuring their knit sweater vest which comes in a variety of colors. This little business is based in Carrollton, Georgia, and has some trendy pieces for any woman. Some of my favorite things they carry are scarves and dresses, and they also carry plus sizes! The best part about shopping with a small boutique? Finding unique clothing and accessories — and that is exactly what I found in this sweater vest. Think blanket cardigan turned vest! 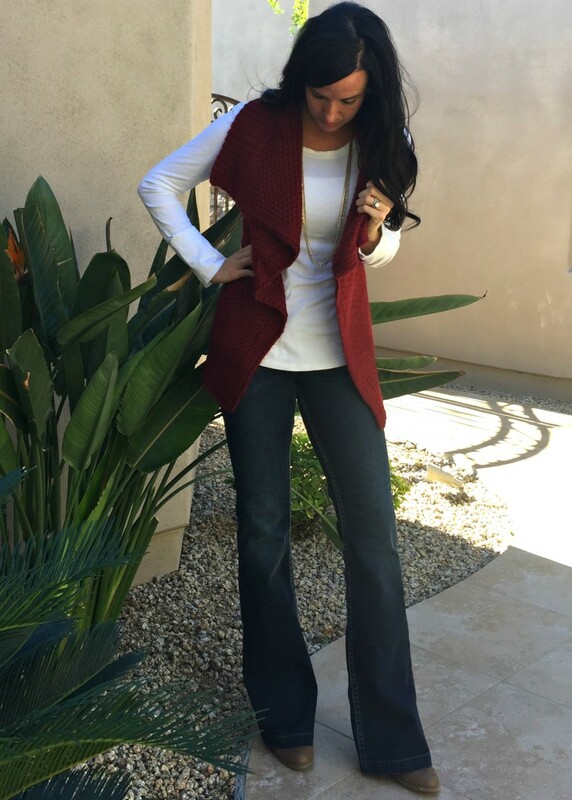 I paired the vest with my favorite Suki Flare Jeans from Silver Jeans, and I also think they’d look great with Silver’s Suki Skinnies and some brown boots like these! Visit The Market Boutique and take a look around – use code TEACHERFASHIONISTA for 15% off your purchase! Have a great rest of the week, all! I love this piece! And I love the color of the one you’re wearing especially for this time of year! I will be checking out The Market Boutique for sure!